Donald Swanson, Research Geologist for the Hawaiian Volcano Observatory, has been recognized by Marquis Who’s Who Top Scientists for dedication, achievements, and leadership in geology. Dr. Swanson developed an interest in the earth while he was an undergraduate. He had a couple of inspiring teachers and began working with active volcanoes through friends and colleagues. He took courses in graduate school and studied old volcanoes. He joined the US Geological Survey, which gave him the opportunity to go to Hawaii in 1965. 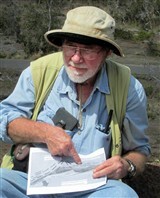 He joined the Hawaiian Volcano Observatory in 1997 as the Scientist-in-Charge and in 2004 became a research geologist. Dr. Swanson worked with the US Geological Survey from 1965 to 1996, traveling throughout Hawaii, California and Washington. He specializes in volcanology and field geology. In his current role, Dr. Swanson works with students who visit Hawaii on active volcanoes. Currently, he also writes research papers on active and recently active volcanic activity in Hawaii. A highlight of Dr. Swanson’s career was the Mt. St. Helen’s eruption in 1980. He was there before, during, and after the big eruption. That was both a tragedy and a positive intellectual experience. No one knew it was going to be nearly as large as it was, measured by how rapidly the lava dome was growing. He used this information to predict when the next rapid spurt of lava would be. After discovering his passion for geology during college, he earned a Bachelor of Science in the field from Washington State University in 1960. He continued at Johns Hopkins University to receive a PhD in geology in 1964. In addition to his work with the US Geological Survey and the Hawaii Volcano Observatory, Dr. Swanson has consulted for the US Department of Energy, providing his skills as a volcanologist for the New Zealand Geological Survey and advised the Colombian Volcano Observatory. Furthermore, Dr. Swanson taught at the University of Washington as an affiliate professor from 1992 to 2015. Since 2002, he has taught at the University of Hawaii as an adjunct professor. Throughout his career, Dr. Swanson has maintained professional affiliation with a variety of organizations. These organizations include the American Geophysical Union, the American Association for the Advancement of Science and Sigma Xi. His work has also been recognized on numerous occasions. In 2016, he received the Shoemaker Communications Award from the US Geological Survey and the Distinguished Career Award from the Geological Society of America. In 2015, Dr. Swanson was recognized with the Woodford-Eckris Lecturer Award from Pomona College. Prior to this, he received the Distinguished Service Award in 2005 and the Meritorious Service Award in 1985 from the US Department of Interior in. Earlier in his career, Dr. Swanson was recognized with the Superior Service Award from the US Geological Survey in 1980.